An open mind transforms our restrictions into celebrations. Do some of your allergies or sensitivities feel like a death sentence? A horrible, twisted joke? Or a major restriction on how you live your life? Gosh, I know that feeling. But it doesn’t have to be this way! We can give up the allergy fight and liberate our choices by just looking at things a little differently. The opportunity to be creative. The opportunity to liberate your emotions around food. The opportunity to open yourself up to limitless abundance. And today, we transform our restrictions into celebrations by switching out dairy… for beans. Remember, an open mind transforms our restrictions into celebrations. I am committed to helping you celebrate your allergies by creating ways that you can enjoy the foods around you. 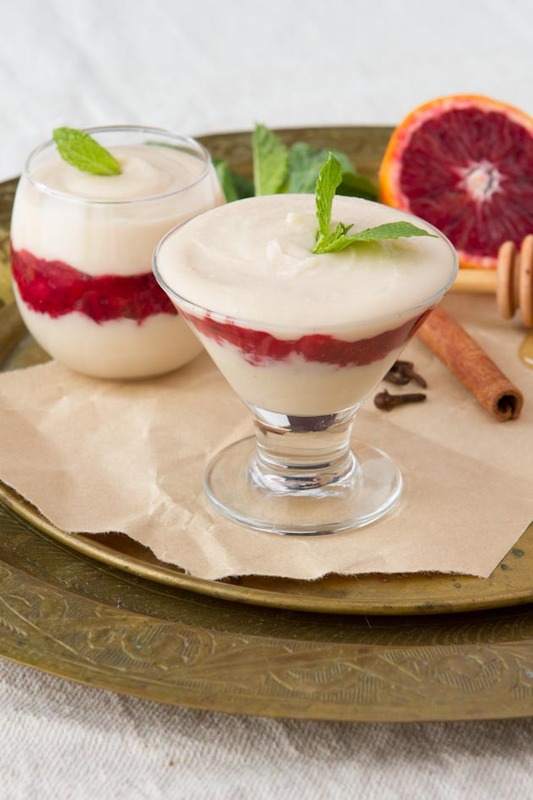 One of my new favorite Done with Dairy Toolkit tricks, is replacing the cream and starch of your favorite pudding recipe with cooked navy beans. 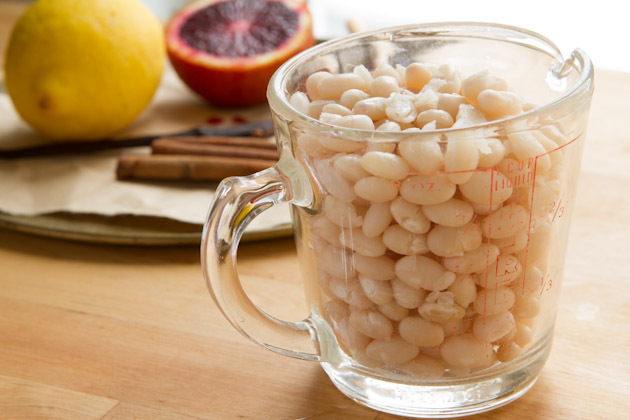 This bean pudding recipe that I’m sharing with you today was featured on Cara’s Cravings last week! 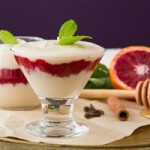 A dairy-free, low-fat dessert made with a fruit-sweetened blood orange sauce, layered with a dairy-free lemon cream. 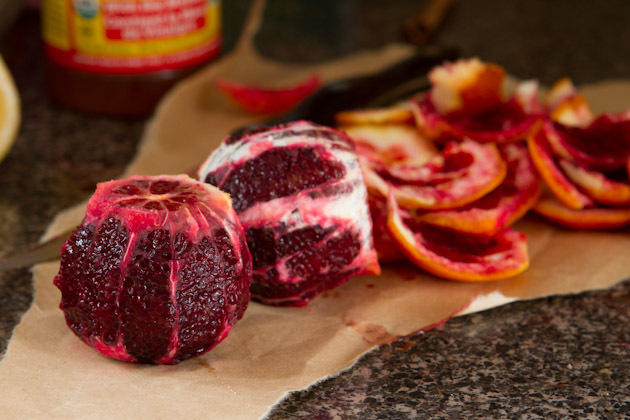 Completely remove the rind from the blood oranges with a sharp knife. As the picture above displays, you’ll be left with a skinless orange. Then, break into it’s natural segments and remove the flesh from the skin. Once you’ve removed the flesh from the skin, place in a small saucepan and continue with remaining segments. Once complete, add remaining sauce ingredients to the saucepan and bring to a simmer on medium-low heat. Cook uncovered for 8-10 minutes, stirring frequently, until apple pieces are soft. 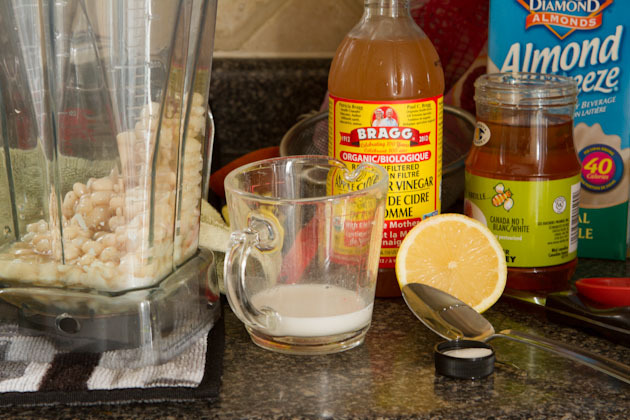 Meanwhile, add dairy-free lemon cream ingredients to the bowl of your food processor or blender. Begin with 1 teaspoon of dairy-free milk. Blend until smooth. If the cream needs a bit of thinning out, add extra milk. The amount if milk needed will vary depending on the type of beans used – home cooked, or canned. Even canned varieties differ in consistency so it's better to start off with 1 teaspoon and work your way up. For my homemade batch of cooked beans, I used 3 teaspoons of non-dairy milk. Feel free to use 160 grams of any fruit of your choice. Regular oranges, extra apples, or berries work nicely. Navy beans are recommended because they're very silky in texture. Honey can be replaced with whatever liquid or granulated sugar you have on hand. Coconut oil can be replaced with the same amount of grape seed oil, almond oil or macadamia nut oil. It helps the cream maintain its richness. 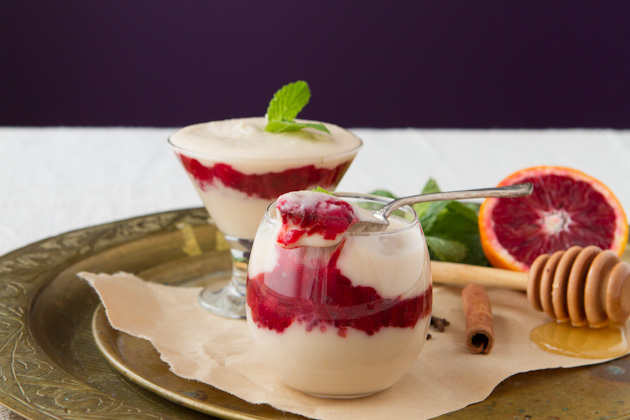 The most challenging part to creating this recipe is removing the blood orange flesh from the segments of skin. If this sounds totally crazy to you, feel free to swap it out with another fruit. Has there been a time where you felt defeated by your allergies, sensitivities or eating style? What did you do to get yourself out of the rut? Leave a comment below telling me about it. Remember, the more detailed your responses, the higher the likelihood that someone in our community will benefit from them!